A car's interior encompasses far more that just seats and door panels. Center consoles, deck lids, headlines and carpeting are some of the other areas you have to consider when restoring or creating a new interior for your vehicle. 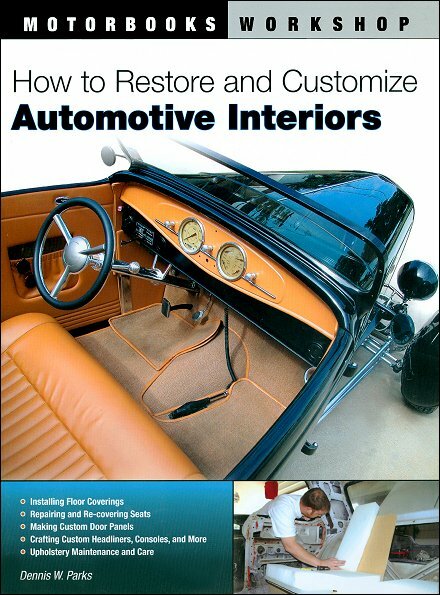 In How To Restore and Customize Automotive Interiors author Dennis Parks walks you through many of the most popular upholstery techniques, so you can learn what it takes to wow judges and spectators at car shows. Detailed color photos provide step-by-step instructions accompanied with easy-to-understand text instructions, for each section. For a growing list of automobiles, vehicle-specific molded carpet is available, making the installation of new carpet an easy proposition for the do-it-yourselfer. Take the new carpeting out of the packaging and lay it as flat as possible for 12 to 24 hours at normal room temperature to return it to its original shape. Remove the car's seats, seat belts, doorsill plates, and anything else that mounts to the floor if at all possible. Remove the old carpeting but don't throw it away. Also remove the old padding. Now is a good time to vacuum the floor, gather up all the loose change, and remove all the gum wrappers, potato chip crumbs, and anything else that does not belong under the carpet. Determine the front end from the rear end of the new carpet. A heel pad will be located directly beneath the accelerator pedal, helping you to determine how the new carpeting should be oriented in the vehicle. If the new carpeting does not have a heel pad, lay the old carpeting atop the new, turning it as necessary to achieve the best fit. (On most vehicles, this should be fairly obvious). With the old carpeting properly situated atop the new, mark any holes that need to be cut with a piece of chalk. There are typically holes for seat mounts, seat belt mounts, and possible a floor shifter. Other holes might also need to be marked and cut. Reinstall all the bolts that thread into the floor pan before installing the carpet into the vehicle. This step helps align the carpet, as each bolt has a corresponding chalk mark on the new carpeting. Fold or roll the new carpet as necessary to fit it through the car door, then unroll or unfold it so it lies flat. Center the carpeting over the transmission hump and transmission tunnel and then work toward the sides. Ask a question about How To Restore and Customize Automotive Interiors.